GameStop is slashing prices on Rock Band, Rock Band 2, Guitar Hero World Tour, Guitar Hero Aerosmith and more, likely in anticipation of this year's new music games bearing the Rock Band and Guitar Hero names. That means big savings. "What kind of savings?," you ask. 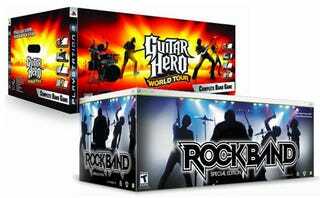 How about the full Rock Band package, guitar, drums and microphone included, for just $69.99? Great for you, a little tougher on those of us who paid full price and have a busted drum head. Maybe a $34.99 asking price for Guitar Hero III with guitar controller will ease my pain. The deal gets a little better when one factors in free shipping. That was not a typo! Whatever the solution, these prices are insane. Go on and get yourself something nice with the name Rock Band or Guitar Hero on it, extra cheap. You deserve it!